JOZO has been adding a pinch of love to lives since 1929. Our long history has made us master the skills of mining and grinding salt to perfection. Our Sea salt originates from Bonaire and is harvested using ancient techniques. Rich in minerals and trace elements, this salt has an extra coarse grain, that slowly dissolves and creates a true salty taste explosion. The shape and size of a salt grain determine the flavor impact. That is why JOZO salt is crystallized in various sizes. JOZO 05 sea salt has an extra coarse grain, that slowly dissolves and creates a true salty taste explosion. 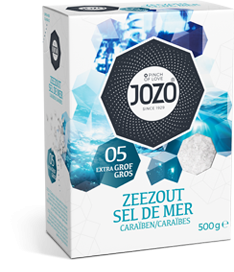 JOZO sea salt originates from the Caribbean island of Bonaire. Ocean salt is harvested from salt pans using ancient techniques, after which it is washed, dried and sieved. It is rich in minerals and trace elements, which gives the salt a milder flavor.